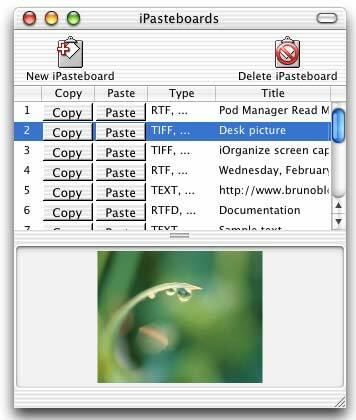 Have you ever wanted to have several clipboards available to let you copy and paste between applications more easily? iPasteboard is the perfect application to help you overcome the one-clipboard limitation. iPasteboard lets you create an unlimited number of clipboards , easily accessible from a clean and efficient user interface. Designed and optimized exclusively for MacOS X, iPasteboard features a great-looking Aqua user interface, a service menu, a dock menu, image & text previews. Download this file to freely test iPasteboard. It can also be used as an updater for registered users. A convenient and secure online store is available through the eSellerate payment service.